May 27, 2017 May 27, 2017 susanwithpearls Beauty, FUN, Laughter, playfulnessTina Fey, Tina Fey beauty, Who cares? What memories do you have of beauty? How are beauty and freedom related? What am I learning passively, simply by showing up to think about beauty every day? It’s a day for humor. You know why? ‘Cause humor is beautiful! Haaaaaaaaa. Laughter is beautiful. Joy is beautiful. Funny is beautiful. I’ve noticed recently that my laughter has increased. I can find humor and playfulness in so many things these days. 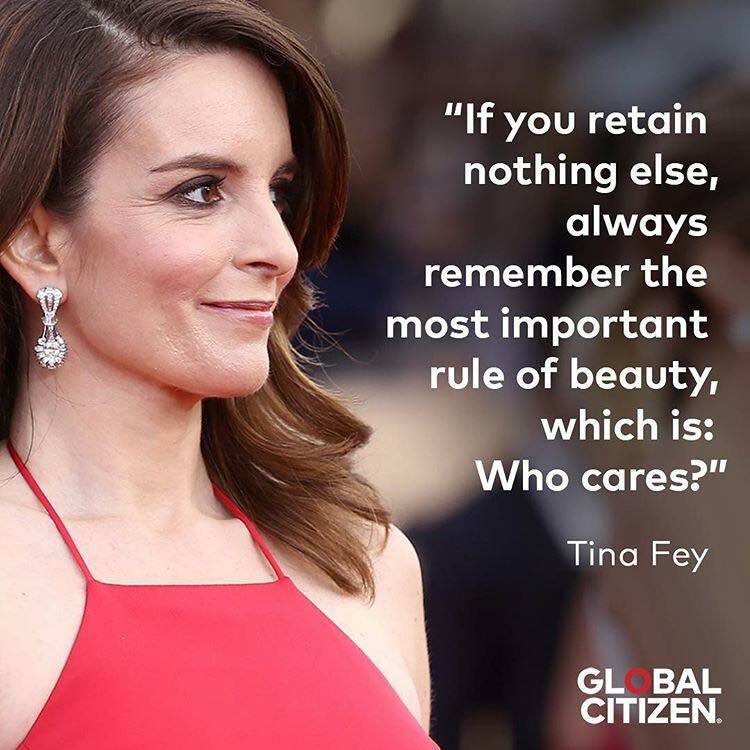 In the Tina Fey quote, at first when I saw it, I read it to mean something like, “Who cares how people look?”, implying that beauty is not in the appearance, or that face/body beauty is not an indicator of “real” beauty. When I looked more closely, and thought about my own laughter-as-associated-with-beauty, I understood it to mean something more like this: “Stop worrying, stop caring so much about what other people think, then everything will be beautiful and you can laugh and sing and dance with life”. I know that might seem like a leap, but it’s how I feel, based on my experience of laughter, and of beauty. As I have been letting go of attachments, letting go of situations and people where I have no control, I have found that I can laugh at more things, and that laughter is a lightness, which is beautiful. I’ve been able to take very serious situations and feel the humor in them. Then, when I say something out loud, then laugh, it’s like a bubble bursts, and the whole room feels lighter (or more uncomfortable, I suppose to those people who are so very serious). But seriously. Why be so serious all the time…who cares? Our lives are a flicker in the expanse of eternity. Live. Love. Be. Laugh. Find the beauty in everything…everything, even in seriousness. Bring Joy. Bring Laughter. Who cares? Be the beauty you are. Let go of others’ expectations. Let go of ideas of “how you should be”. Be Free. Be You. Be the best You you can be. Love yourself. Love Life. Love ALL of Life. Love every minuscule minute which is only a flicker of a flicker. Laugh out loud. Really, not just “lol”. Really do it. and mean it. Have you noticed that people who really laugh are both scorned and envied? People don’t know how to laugh, so they scorn those who do. Show them how to laugh. Bring them into your light, the lightness of your joy and playfulness. Play with people. Have fun. Just enjoy them. Love them. Look for their beauty. Show them their beauty. Be beautiful with them through your laughter. Because who cares if you are scorned? Who cares if you are envied? Laughter is so much more fun.